At lunchtime today, we had our office Halloween party. We had a pizza lunch, a variety of silly games, and a costume contest. I didn’t wear a costume, but wore my sparkly Happy Halloween t-shirt, Halloween socks, an assortment of Halloween jewelry, and a headband with devil’s horns. 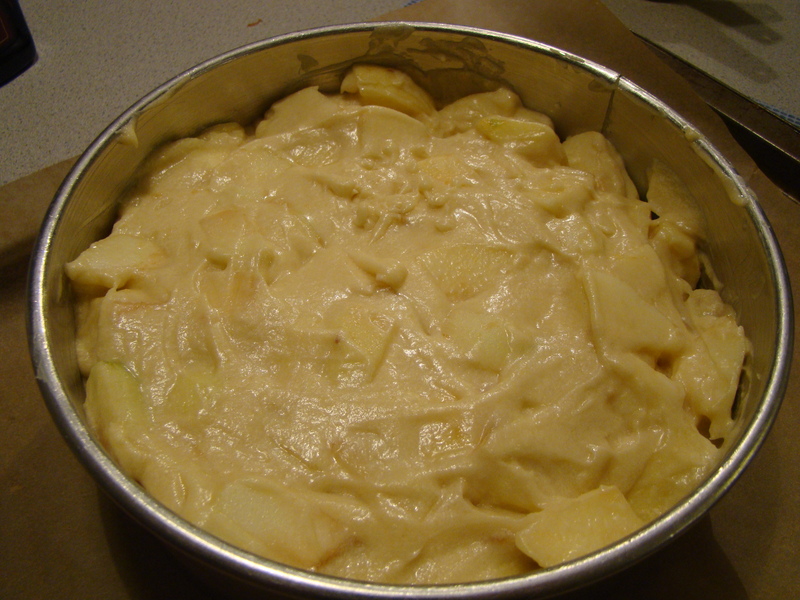 Conveniently, we also had a dessert potluck, so I made Marie-Helene’s Apple Cake. Apple cake doesn’t have any chocolate in it, so Howard wasn’t likely to eat any. Bringing the cake for the potluck meant it would get eaten, and not entirely by me. It was popular and the first plate to become empty. A few people asked for the recipe. I went to Wilson Farm, a local farm stand, and picked up a variety of local Massachusetts apples. I used four different ones, as Dorie suggested. 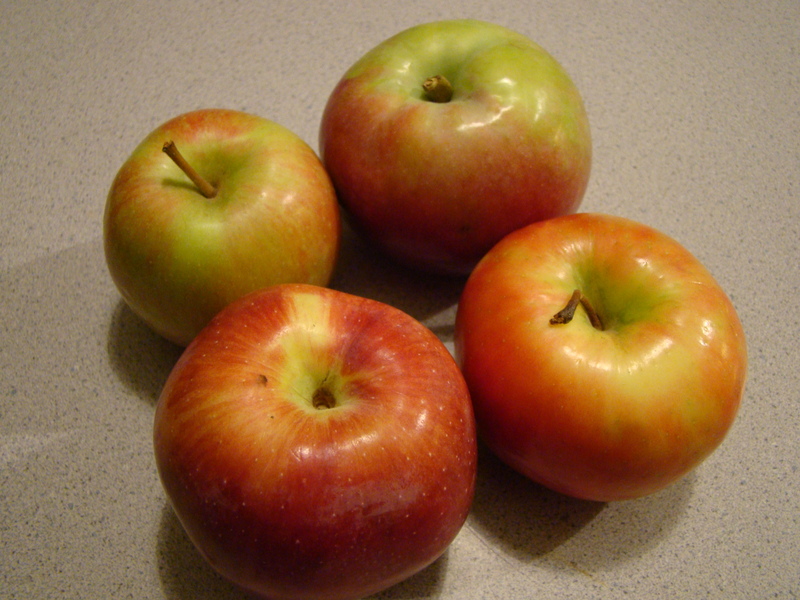 I chose Honeycrisp, Spencer, Empire, and Macintosh. I wasn’t sure my apples were large enough, but I went with just the four. For future reference, I measured, and I had a generous four cups of apple chunks. I don’t do a lot of baking without electrical assistance, like my food processor or stand mixer. I was a bit uncertain about how foamy the eggs should be. I decided they looked nice and foamy after one minute of whisking. The color was a nice light yellow too. It darkened up when I added the rum, but lightened again with the flour and butter. The batter looked silky after all the butter was mixed in. The raw batter tasted good too. The rum flavor was very noticeable. I read other comments from people that used a 9-inch pan. Fortunately, I have an 8-inch springform pan, so I made sure to use it. The batter filled the pan fully, so I felt I used enough apples after all. The cake was nice and brown after an hour, but still hadn’t pulled away from the sides of the pan, so I gave it five more minutes. It still hadn’t pulled away, but it was definitely done. I thought I was generous with the butter, but I think I should have used even more when I buttered the pan. The top of my cake was a beautiful golden brown, and the cake looked incredibly moist. The sides weren’t browned at all. The cake pictured in the book has equally browned sides. I used the parchment paper trick again to easily transfer the piping hot pan to the cooling rack. I remember doing that when we made the mustard tart a few weeks ago. The cake came out of the oven shortly before bedtime, so after I removed the springform pan, I let it cool, uncovered, on the counter overnight. Unfortuntely, I can’t say I was wild about this cake. 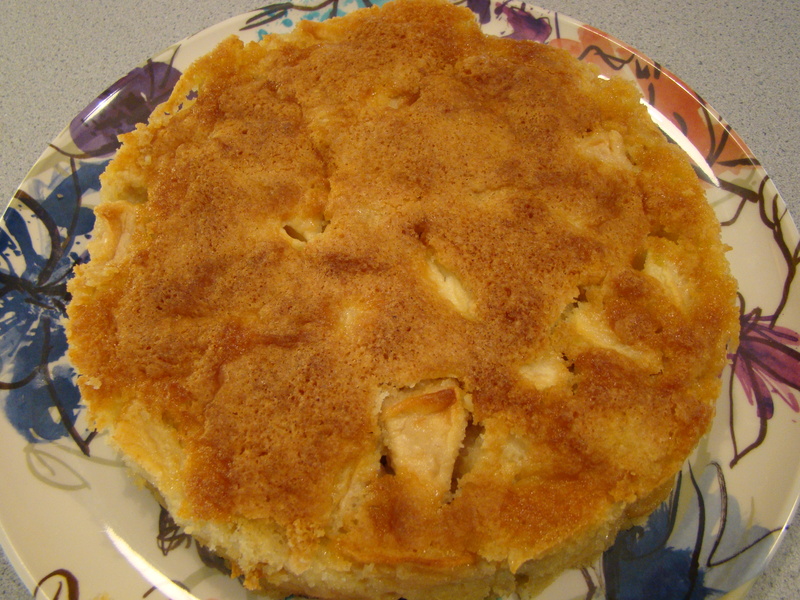 A few years ago I made The Apple Lady’s Apple Cake from Patricia Wells’ The Paris Cookbook. It was very eggy, almost more like a clafoutis, and I didn’t like it that much. I compared the recipes, and Dorie’s recipe had more flour, more sugar, more fat (butter instead of oil) and no milk, so it seemed like it would be different. It turned out that the two cakes tasted very similar. Today’s cake looked so pretty, but the cake that held the apples together wasn’t cakey enough for my taste. I’m not sure I’ll make it again. I want to share something I learned from my friend Karen. I do this most times when I make apple desserts. I make sure to wash the apples before peeling. Then, I put the apple peels and the cores into a small saucepan with some water. For the four apples in this recipe, I added 1 cup of water. I bring the water to a boil, then reduce the heat to a simmer and cook until the apples are mushy. After letting it cool a little, I run the mixture through a food mill, with the blade with medium holes. If you like, you can add a bit of sugar or honey. I get the bonus of a scant cup of applesauce. Even though I compost what doesn’t go through the food mill, I love making the most of the apples with this extra treat. 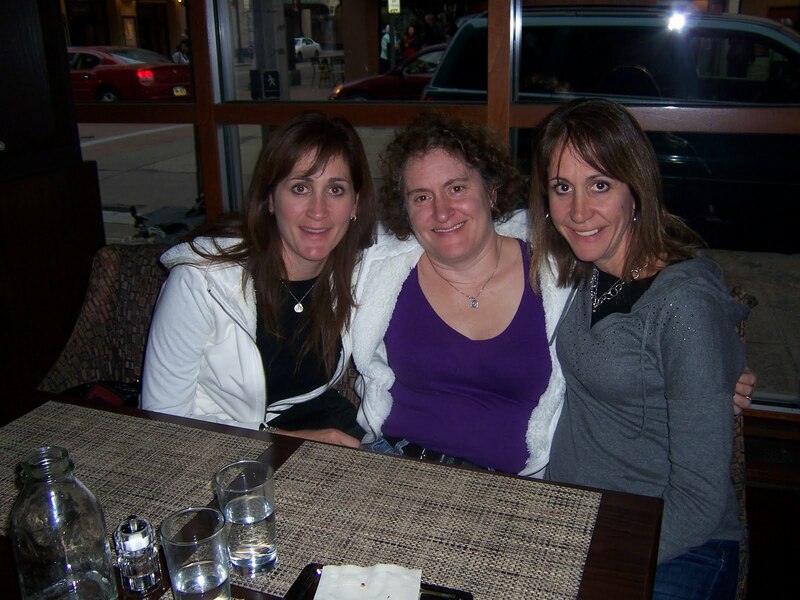 For the past ten years or so, my sisters, Jane and Jennifer, and I meet somewhere to spend a girls’ weekend together. Before she passed away, our mom joined us too. We’ve been to New York City, the Culinary Institute of America in upstate New York, the beach in Delaware, my cottage in Maine, and Atlanta. Last year, we joined forces with our aunt and cousins who have their own girls’ weekend, and the seven of us spent a fun-filled weekend in Reading, Pennsylvania. This year’s destination was Pittsburgh. Late Friday morning, our three flights from Boston, Philadelphia, and Baltimore arrived on time, within ten minutes of each other. We picked up the car and headed into the city for our weekend adventure. First stop, we checked into our hotel, right downtown. Next stop, lunch! 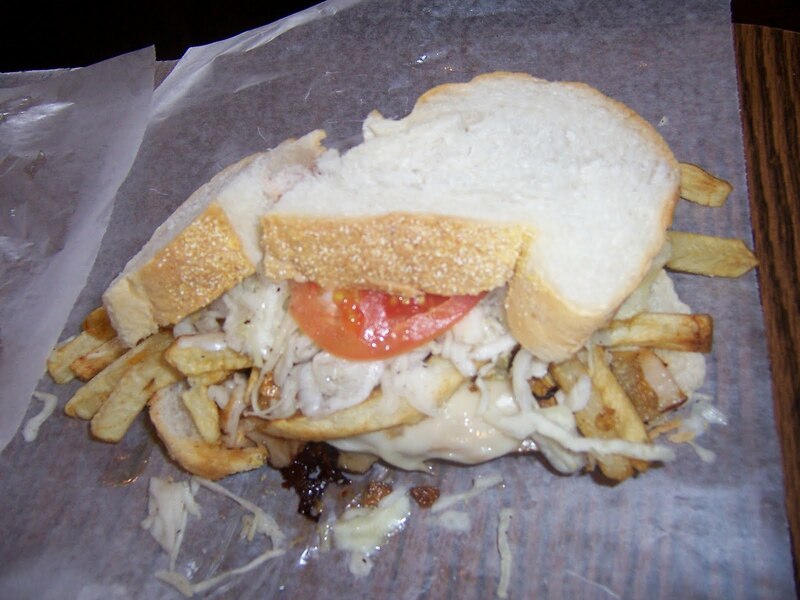 We went to Primanti Brothers for classic Pittsburgh sandwiches. We picked turkey and chicken, piled high with French fries and cole slaw. After lunch, we wandered through the Strip District. There were vendors with tables full of Steelers merchandise. Plus, there were all kinds of ethnic markets: Asian, Italian, Middle Eastern, candy shops, bakeries, kitchen stores. We browsed for a couple of hours. We were trying to take Segway tour. Jane and I recently Segwayed in our respective home cities. Jennifer wanted to try. However, they didn’t answer the phone, and when we went to their booth at Station Square, it was unattended. 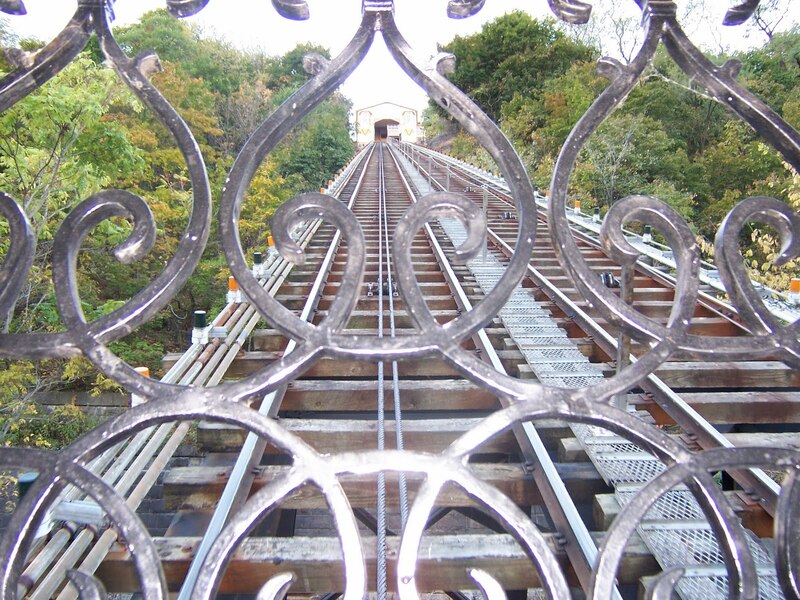 Instead, we took a ride up the Monongahela Incline and admired the view from Mt. Washington. Before dinner, we went back to our hotel room and played the requisite games and awarded prizes to the winners. Our mother taught us to play games, very competitively. When we were a foursome, we loved to play Taboo (Jane’s team always won). With three people, it doesn’t work as well, so we play a lot of Bananagrams. Also, we play very competitive Spit (a card game). For dinner, we went to Lidia’s of Pittsburgh, owned by Lidia Bastianich of PBS cooking show fame. The room was vibrant and colorful and showed promise. We loved the salads we ordered to start, but our entrees and desserts were nothing special. Because we all love to eat delicious food, we were a little disappointed. For consolation, we went back to our room and played more games before we went to sleep. Saturday, the sun was shining. We called Segway one more time, but opted for a morning duck boat tour instead. Our driver Jim and tour guide Karen gave us an entertaining and informative ride through the streets of Pittsburgh, with a cruise on one of the three rivers that meet in Pittsburgh. 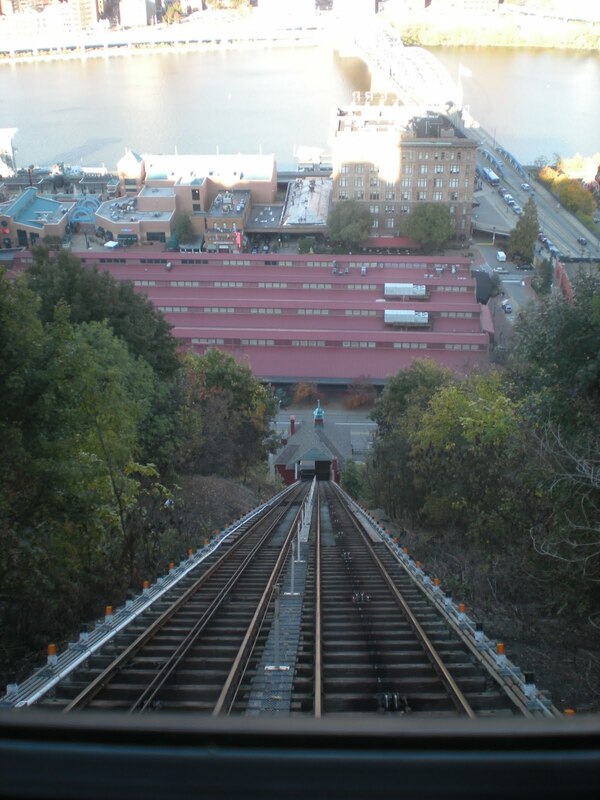 There are restaurants at the top of the nearby Duquesne incline, so we took another ride to the top of Mt. Washington to dine with a spectacular view of the city. Our afternoon’s entertainment was a visit to the Andy Warhol Museum. It was the opening day for a Marilyn Monroe exhibit. There were hundreds of photographs of her plus, of course, Andy Warhol’s classic Marilyn Monroe silkscreen prints. We enjoyed two floors of Marilyn photos and the Campbell Soup Can collection. There were a few rooms of Andy Warhol’s video art. Overall, we decided he was one strange dude: creative, but strange. From the museum, we walked to the Cultural District of Pittsburgh to see if we could find an interesting performance to attend Saturday night. We settled on a student production of Phantom of the Opera at the Byham Theater. We snuck in dinner at a nearby restaurant Six Penn Kitchen. 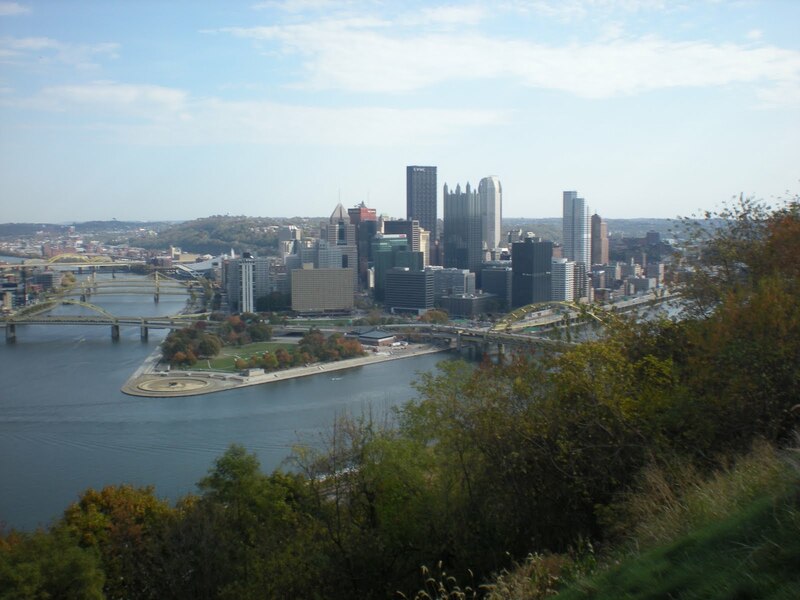 The restaurant features local food, sourced from around Pittsburgh. Dinner was a hit! We all had bowls of the spicy sweet potato and chipotle soup. Jennifer and I shared the pumpkin gnocchi and Arctic char with bacon and Brussels sprout hash. Jane enjoyed the trout taco. Unfortunately, we didn’t have room for dessert. Phantom was awesome. The students in the lead roles were impressive. They all had strong voices that delivered the familiar music. The program indicated the orchestra was made up of many students in grades 6 – 12, but they sounded professional to us. It was an enjoyable evening. Sunday morning, we went to Shadyside to have brunch at Pamela’s. We had read they served the best breakfast in Pittsburgh. The wait was long, but our omelets were delicious. The hash browns were also tasty. The pancakes were amazing. After breakfast, we did a little browsing and shopping. Our final stop before the airport was a return visit to the Strip District. Overall, we made the most of the city of Pittsburgh. We found the people, both the natives and the other tourists, to be very friendly. We got tips on things to do and places to eat from people we met on the street. Everyone was chatty! As usual, we packed in the activities and had a great time. I wonder where we’ll go next year.